Home > Shop by Brand > Marine 31 - Waxes, Cleaners & Polishes > Marine 31 Polishing Pad Cleaner 16 oz. Powerful pad cleaning with the convenience of a powder! Marine 31 Polishing Pad Cleaner is a fast-dissolving powder that deep cleans the caked-in residue that limits your polishing pad's performance. Marine 31 Polishing Pad Cleaner quickly dissolves in water to create a powerful pad cleaning solution without the need for foamy degreasers or caustic residue. This citrus based cleaner is eco-friendly and harbor-safe. Marine 31 Polishing Pad Cleaner is powerful to clean the nasty gunk and sticky gel-coat residues from your polishing pads. Polishing a boat, RV, or watercraft contaminates your polishing pad and quickly reduces its performance. 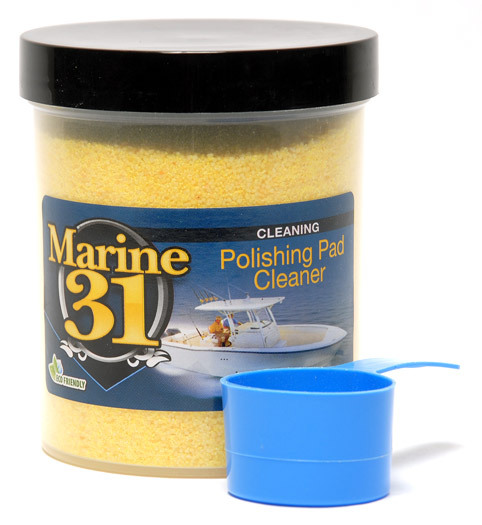 Marine 31 Polishing Pad Cleaner uses the power of citrus to work quickly, loosening the contaminants' grip on the foam or wool fibers so you can rinse them away. Clean polishing pads have a longer life. Polish residues and chemicals can stain or break down the polishing pad if left to dwell for too long. Dissolve Marine 31 Polishing Pad Cleaner in a bucket of water. Allow the polishing pad to soak in the solution for 15 minutes and agitate (if needed) with a soft brush. Rinse the pad with a stream of water or in a bucket until residue runs clear. Allow pads to dry before next use. Marine 31 Polishing Pad Cleaner will also clean wax residue, polish residue, and grease stains from microfiber materials. Use this exceptional cleaner to rejuvenate your hard-duty towels or microfiber pads. Dissolve three scoopfuls into three gallons of water. Put used foam, microfiber, or wool polishing pads into solution and allow to soak for 15 minutes. Use a Foam Conditioning Brush to lightly scrub any stubborn wax or polish deposits. Rinse the pads thoroughly and allow to dry. A Word From the Captain's Chair: The Marine 31 Polishing Pad Cleaner solution can be reused for up to a week. Mix the solution in one of Marine 31's 5-gallon Wash Buckets with a screw-on Gamma Lid. It is a great choice for professional detailers or enthusiasts who are embarking on a gel coat polishing adventure. Anchors up!